James Burton at Symphony Hall in Boston. 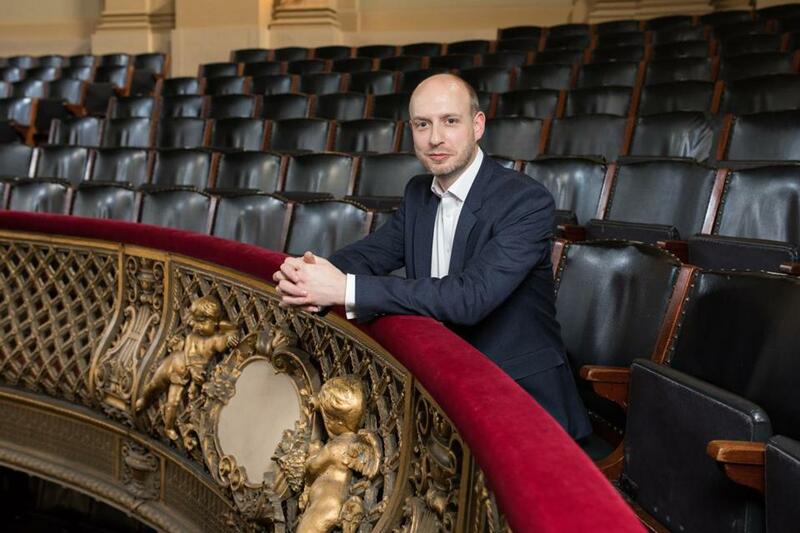 The Boston Symphony Orchestra has named James Burton the new conductor of the Tanglewood Festival Chorus, and Burton is also assuming a newly created post as BSO choral director. Burton, who was born in London, is only the second conductor of the Tanglewood Festival Chorus; John Oliver (now conductor laureate) led it from its founding in 1970 to his retirement in 2015. Burton’s initial contract with the BSO begins immediately and runs through the end of the BSO’s 2021-22 season. Burton is not a newcomer to Symphony Hall. His work first appeared on the stage 19 years ago, when he contributed orchestrations to Arlo Guthrie’s performance with the Boston Pops. The two collaborated for years, starting when Burton was a conducting master’s student at the Peabody Institute of Johns Hopkins University; at some concerts, Guthrie even called Burton to the stage to perform blues piano with him. “I was never sure if he was going to do it,” Burton said in an interview at Symphony Hall Wednesday, recalling the whirlwind shows with the Massachusetts folk favorite. From Westminster Abbey boy chorister to Baroque operatic countertenor to orchestrator to choral director of such ensembles as the Hallé Orchestra in Manchester, England, and the Schola Cantorum of Oxford, England, Burton is taking the latest step on a fascinating musical journey. This summer, he and his family will relocate from Oxford to Boston for his new post. According to the BSO, Burton will prepare the TFC for performances with the BSO and Boston Pops, conduct the TFC in its own choral programs, and at times understudy Nelsons and guest conductors, stepping in when needed, for performances of major choral works. He will also consult on program planning, suggesting “new opportunities that would benefit the overall institution by encouraging a broader engagement with choral singing,” according to a BSO statement.